Multi-factor authentication (MFA) or two-factor authentication (2FA) is one of the most significant security upgrades that IT organizations can make for user management. The process forces somebody that is logging into a system or application to provide another piece of data to gain access. Generally, the concept is to use a password and then enter a token that is generated by your smartphone or some other device. The idea is that the password is something that you know and the token is something that you have. So, even if somebody were to gain access to one of those two items, they still would not be able to log in. MFA solutions have gained immense popularity in the last few years because of the number of breaches that sites and organizations are experiencing. Hardly a day goes by without some major enterprise being hacked. Think eBay, Target, Sony, LinkedIn, and many others. There’s so many more yet to come. It isn’t for a lack of trying on the part of these organizations. Virtually all of them take security seriously, but there are just too many surface areas to cover. As a result, IT organizations need to inoculate themselves from these issues. One of the best ways to achieve that is to leverage 2FA in addition to traditional user access management. This is especially true of critical Linux servers. Today’s cloud servers hosted at AWS, Google Compute Engine, Azure, and others are running core business operations for IT organizations. For an organization, a hacked Linux server environment can be deadly. One critical step in the security process is to leverage a central user management system such as Directory-as-a-Service®. As a cloud-hosted directory service, IT and sysadmins can tightly control user access to their Linux systems. With Directory-as-a-Service, IT can also enable the multi-factor authentication feature for Linux systems. On the critical systems, users can be forced to provide their password and the MFA token. 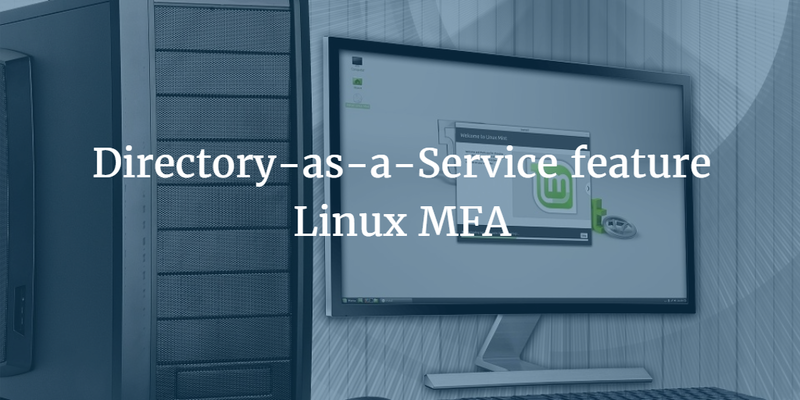 The process to enable MFA on Linux systems with Directory-as-a-Service is simple. There is no extra software to install and manage. Administrators simply enable MFA on the central Web console and users leverage their Google Authenticator app on their phone to generate their tokens. At the Linux server login prompt, users enter the MFA code. There’s no extra software, no extra cost, and no extra hassle. It’s simply a major step-up in security for the organization. If you would like to learn more about how Directory-as-a-Service features Linux multi-factor authentication capabilities, drop us a note. Identity management security is a critical part of any organization’s Identity-as-a-Service strategy. Let us walk you through how you can benefit from multi-factor authentication. Also, feel free to give the cloud directory from JumpCloud a try for yourself. Your first 10 users are free forever.